The LIXIL Group is committed to respecting diversity and recruiting and developing high caliber talent across the Group. We believe that harnessing the intelligence and perspectives of our diverse workforce is critical to driving growth and innovation. United under the LIXIL Diversity & Inclusion Declaration, the LIXIL Group embraces diversity in gender, age, race, nationality, values, background, etc., and turns the energy and creativity generated by diversity into a source of strength. We aim to furnish a comfortable and friendly working environment for all, enabling employees to approach challenges with an entrepreneurial spirit, and be appropriately evaluated for their performance. The LIXIL Group believes the active participation of female employees is vital to promoting diversity. In March 2012, we had one female senior executive (1.0%) in the Group. In March 2017, that number had risen to seven (11.9%), including two directors, two senior managing executive officers and three executive officers. As of March 31, 2017, the number of female managers increased to 687, constituting 12.9% of total management personnel. 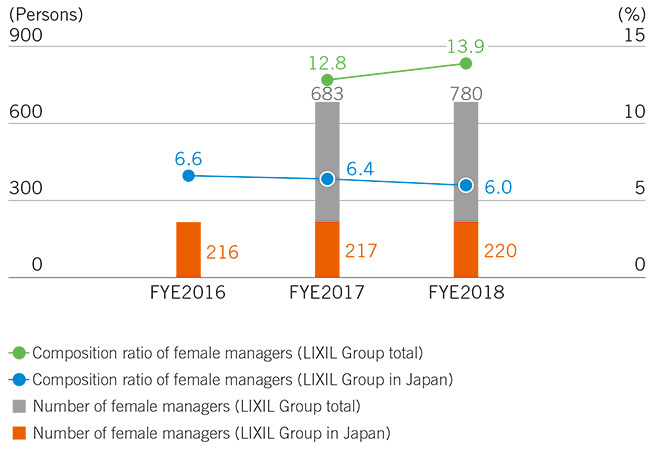 In July 2017, the LIXIL Group was included in the MSCI Japan Empowering Women Index (WIN), which selects companies that champion gender diversity from among Japan’s top 500 companies in terms of market capitalization. LIXIL Corporation has set up the Diversity Promotion Office to further advance careers for women. As a member of “Male Leaders General Meeting (to promote the active role of women)”, an initiative backed by the Cabinet Office, we declared a WeDo Action* plan in August 2014, and are facilitating the appointment of female directors, officers, and managers. As of March 2018, we had 168 female managers (6.1% of all managers), representing absolute growth of approximately 6.8 times compared to 22 female managers (0.9%) in March 2012. *One female director and one female senior managing executive officer are from countries other than Japan. The LIXIL Group has also established frameworks to support independent employee activities so that each and every employee can work enthusiastically and respect each other’s differences. In 2017, LIXIL Corporation launched the LIXIL Diversity Network. In addition to the currently operating women’s network, we have also launched networks for employees involved in childcare and nursing care life stages, employees with disabilities, and sexual minorities. People with an interest in any of these areas are actively encouraged to get together on a personal level to share their troubles and resolve problems, and to improve individual skills and overall corporate value. For instance, to encourage more sales women, who still represent a small number in the industry, to participate actively, we run a Women’s Sales Group in which experienced saleswomen offer support to younger colleagues. The use of video conferencing enables female employees in areas with few saleswomen nearby to connect with experienced people throughout Japan. In FYE 2018, LWT Americas also set up Business Resource Groups (BRG) such as millennials, working women, and multiple cultures, so that employees from diverse backgrounds could meet people from similar cultures and age groups and avoid feeling isolated. The company also offers programs that can provide employees with mentors from similar backgrounds.